So in my family, April to July is a pretty crazy time. Between holidays, birthdays, and anniversaries, it’s a wonder anything else gets done. Which is why I’ve been quiet and have this one post to show for my efforts. 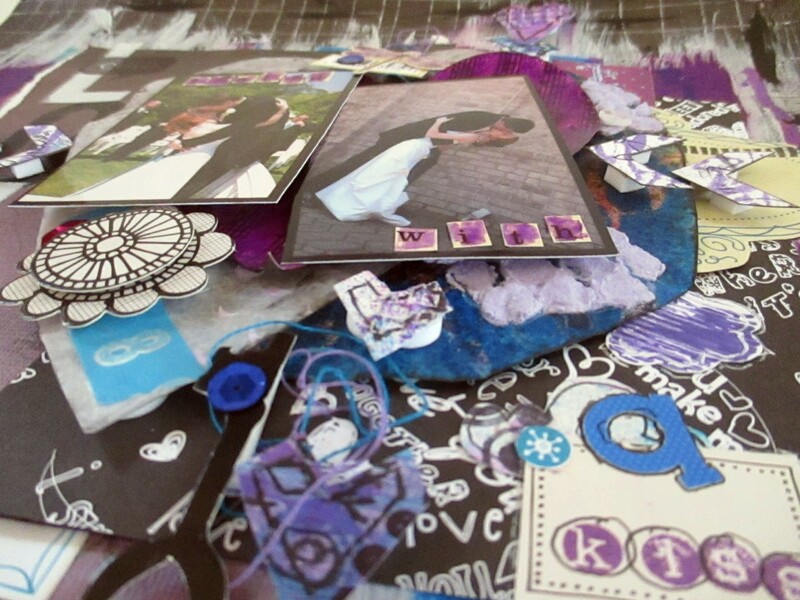 I made a chipboard scrapbook album for a fabulous friend featuring photos from her bridal shower and bachelorette party. I’m now in the process of making an album for the friends’ wedding and honeymoon. 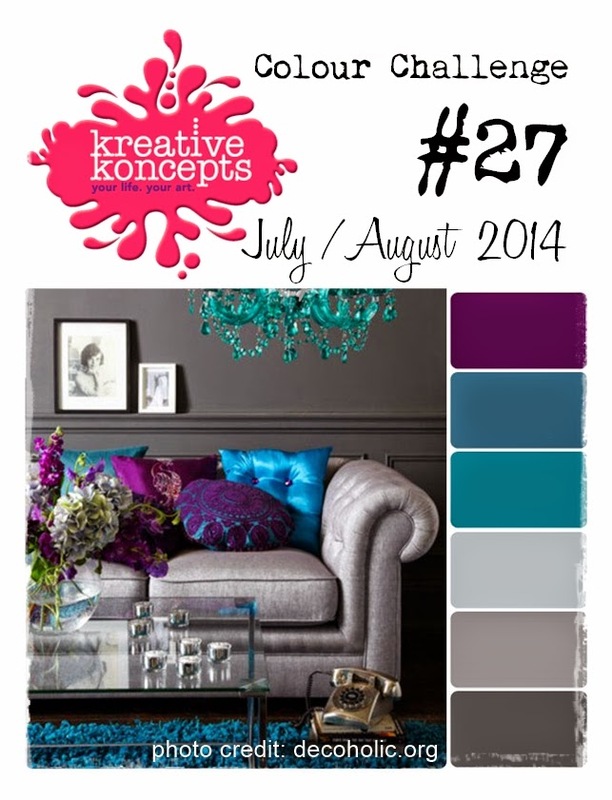 and the color palette from Kreative Koncepts. 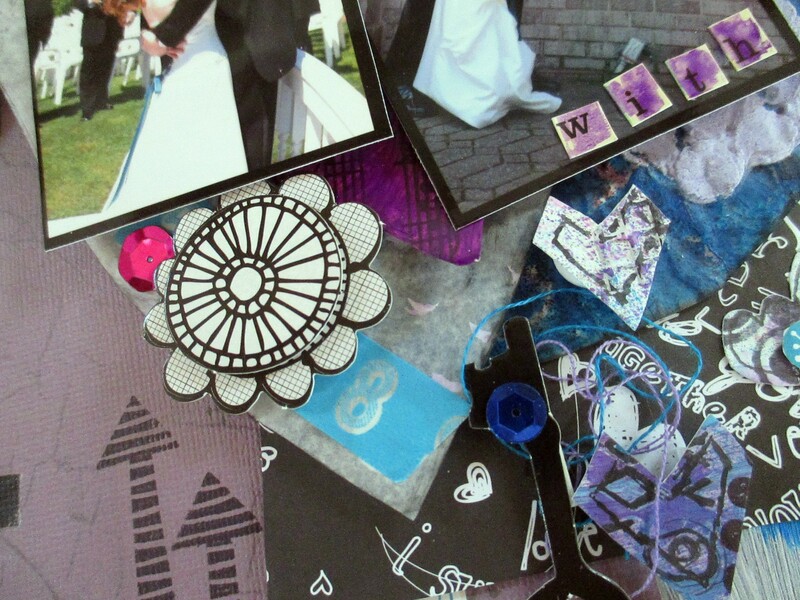 The wedding color scheme was teal and purple, so the color palette just sang to me. 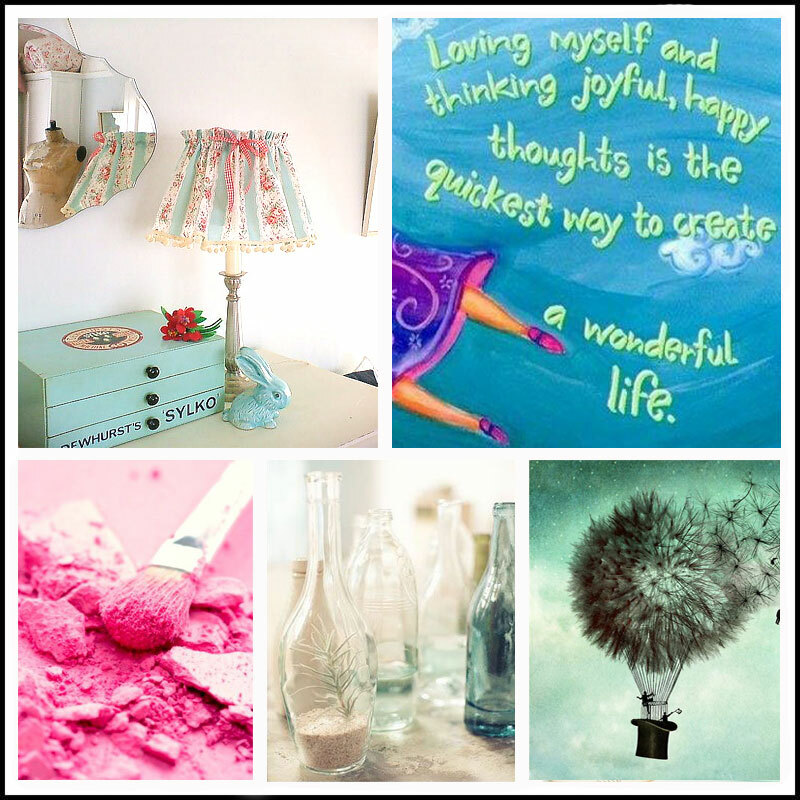 I also really wanted to make something for the July moodboard from Scrap Around the World, pictured below. The colors, and especially the top right block and the quote, seemed very wedding appropriate, as did the rest of the blocks, either literally or figuratively. The letter J stands for a few things for my entry. First off, the first names of the bride and groom begin with the letter J. There’s also the jewel tones of the color palette. I’d also say it stands for the joy of their wedding day. I combined two dark patterned papers to make the background, swirled lines of black and purple glitter glue, then used gesso, paint swipes and Dylusions spray drips to cover the seam. 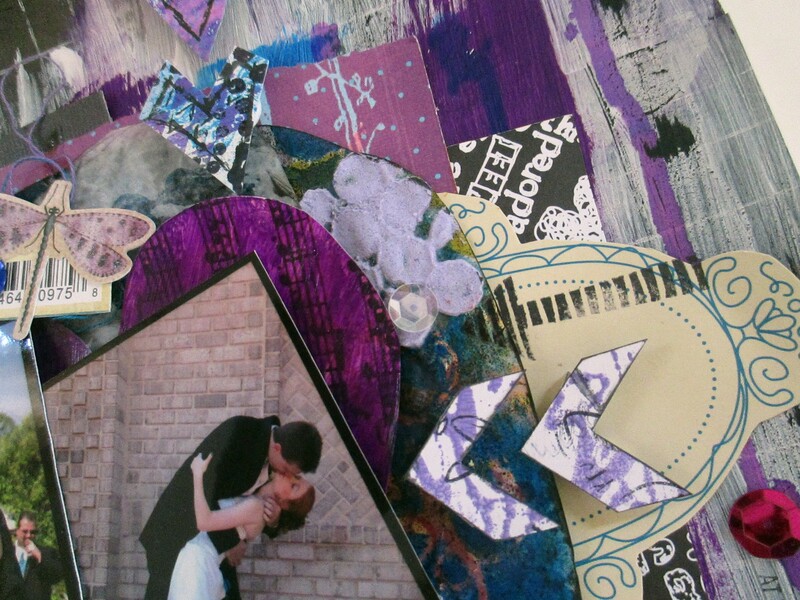 The purple heart is a hand-drawn heart cut out of 7Gypsies paper and painted with a combination of gel medium and Dina Wakley’s Blackberry Violet paint (I swear it smells like grape! :P), courtesy of a tutorial from Miae Rowe on the TCW blog. The other heart is also hand-drawn on deli paper, and was actually a cast-off bit. 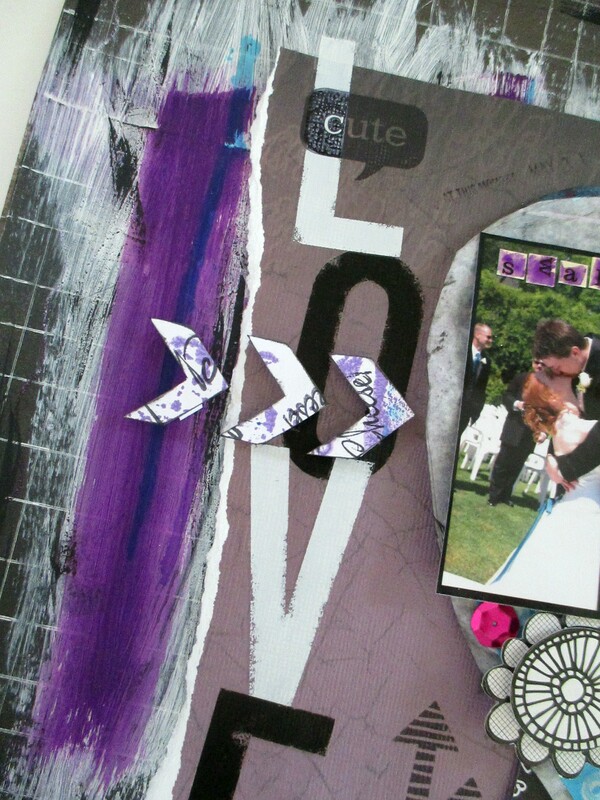 I’d used purple paint through a Prima stencil (raindrops), then used the stencil with white paint on a background paper. I pressed the remainder onto the deli paper and loved it! So I cut out a heart and inked the edges with my Black Coal Ink Edger from Ingvild Bolme. The chevrons are a gelli print stamped with the phrase “Say Cheese!” from a Mama-razzi stamp set (Bo Bunny). 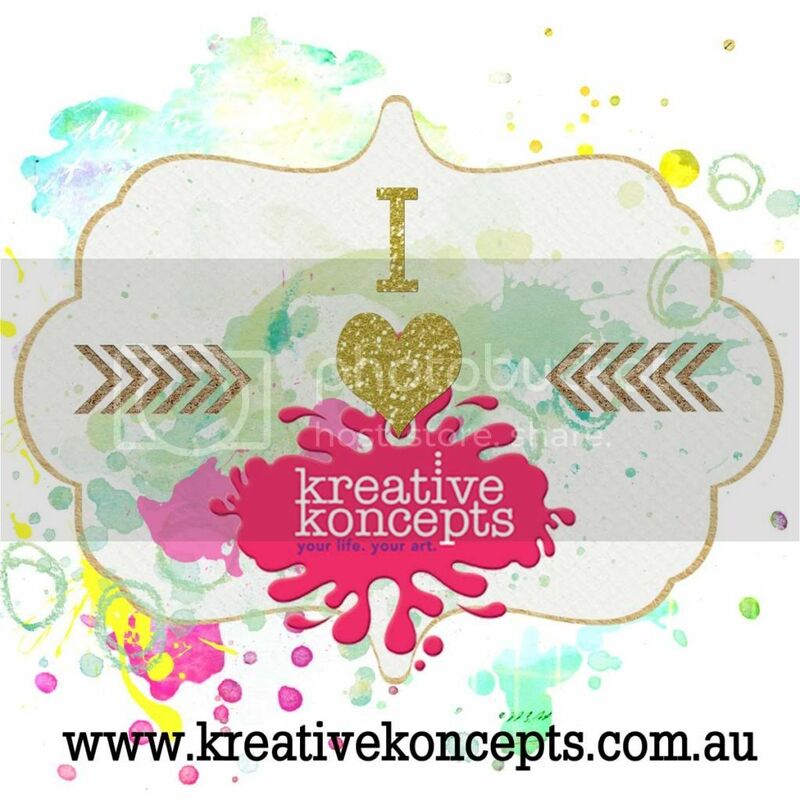 My original background was different patterned patterned paper, that I’d played with, and played some more. It started out as a lightish distressed teal/blue with vintage script written over it. First I scraped some paint across using an old credit card. I also added pieces of Magic Mesh silver mesh and some really garish ribbon that I was going to gesso over anyway. After the gesso, I sprayed Dylusions Calypso Teal and Crushed Grape to get the jewel tones. But I wasn’t extremely happy with it. So I cut it up, thinking I might layer the pieces under my photos. Still didn’t work. Then I broke out some stamps. 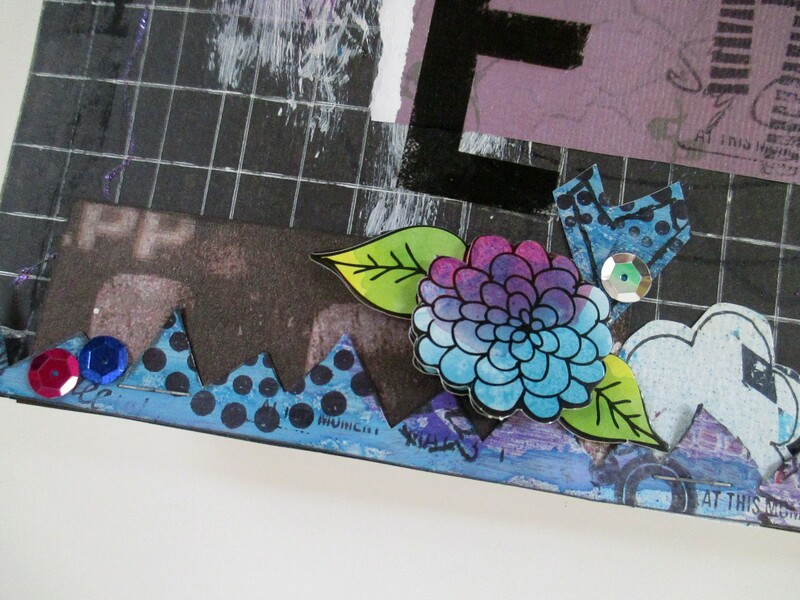 At first I used my purple and blue dye ink cubes, but switched to my Archival Black stamp pad (love this!). I used a Time Holtz Stampers Anonymous butterfly and harlequin stamp and some Inkadinkado circle stamps. The colored images I outlined with a black pen. Then I cut them up even more, but first I drew shapes. Mostly hearts (very Stampotique-esque, but drawn by me), and some clouds. I cut these out and noticed that one line made a nice pointy border. Delicious! So I set about putting my layout together with the prep work done, whew! I combined my two heart shapes with some other patterned papers, and added “LOVE” in rub-ons on the largest piece. Oh, almost forgot the circle shape! This was an experiment. I took gold-printed vellum and flipped it over. 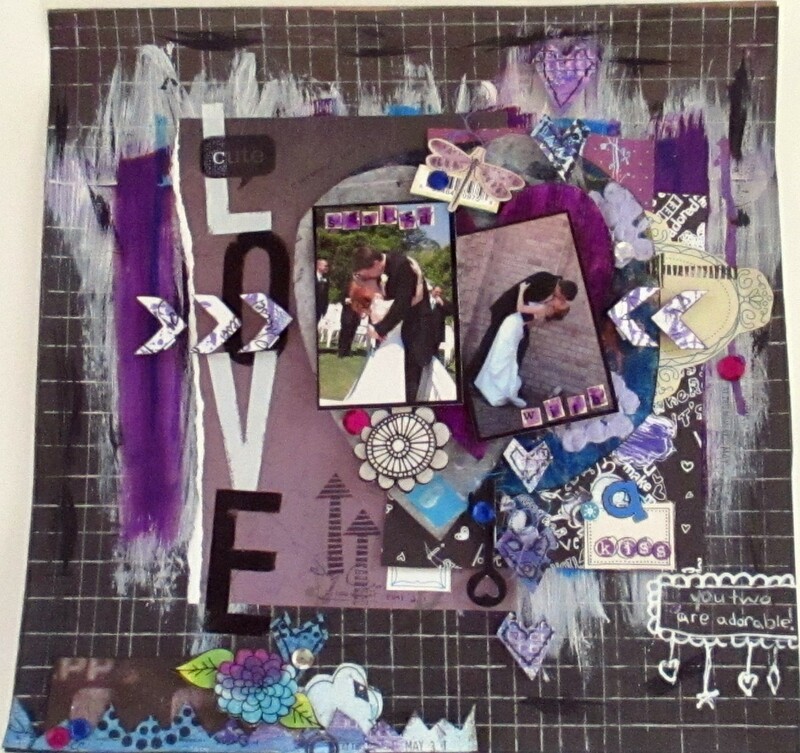 First I gelli-printed onto it, didn’t love it. Then I sprayed some Tattered Angels and dried it, really not loving it. Then I took my TCW mini numbers stencil and sponged blue paint over it. Much better! I had mixed some homemade texture paste with some purple paint and had some leftover, so I grabbed the TCW Ronda Palazzari well-rounded stencil and smooshed the paste through one part of it a few times on the vellum. Beautiful! So I layered all my papers, glued them down with fabric glue (it sticks so well!) and some pop-up adhesive. I added lots of bits after. I added the hearts and chevrons, the zigzag border strip, some Amy Tangerine die-cuts, some stamping, thread, sequins, a touch of washi tape, and did my journaling. I used Cosmos Cricket mini alphas for the title words on the photos, along with a TH Distress Marker. Thank you so much for looking! 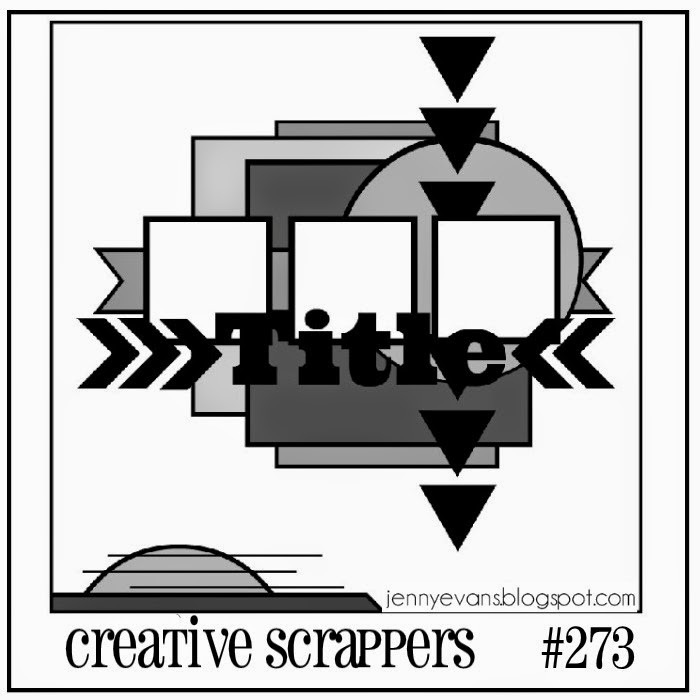 Feel free to leave comments and happy scrapping!